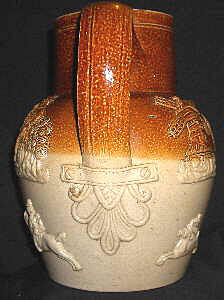 Unidentified Maker 1 - Thomas Smith? Click on any image below to display a strip showing all sprigs. The left hand jug seems to be the earlier and has a number of sprigs that do support the Derbyshire theory (click image to view two examples). They are almost certainly from one of the Bourne potteries and probably either Belper or very early Denby. The handle terminal of the image on the right has been found on a considerable number of specimens varying in size from half to eight pints. The sprigging of these jugs varies considerably but they do form a homogeneous group. Click on the right hand image to see a number of different jugs displaying a variety of sprigs, some of which have also been seen on jugs as widely attributed as Lambeth, Mortlake, and Bristol. Click on album button to view small strip images all major varieties recorded. Click on any strip image to enter the image browser and view the jugs in greater detail. There is also a considerable overlap with some jugs with the leafy S(tandard) E(nglish) T(erminal) of OH&H and others confirmed as being by Thomas Smith of Lambeth and later Old Kent Road. These three jugs, (Click button below to view images), would appear to have many sprigs in common. 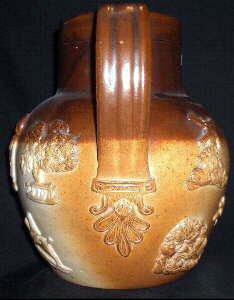 A recently found Thomas Smith jug of this type is marked as being made at the Old Kent Road pottery (hence 1867 or later). For this reason I believe that Unidentified 1 (and the associated group with SET are all the products of Thomas Smith & Co. before their move from Lambeth. Smith’s commencement date of 1836 (Robson’s Directory) would be early enough to cover all known Unidentified1 jugs, even the last example shown of the group. Since attributing Unidentified 1 to Thomas Smith, I have seen two jugs that appear to be too early to be Smith. Both have sprigs also seen on jugs attributed to Vauxhall, so my alternative suggestion is Alfred Singer.